I enjoy coaching clients. I am doing more of it. I describe my role as being a bit of a sounding board. It might be a GP looking to achieve personal goals in the context of a complex set of practice relationships. It might be a manager thinking how they can live a more balanced life. It might be a fashion specialist wanting to develop the skills to have greater impact. These ‘coachee’ clients are keen to stop and examine how far they are living the sort of life they want. Are they on the front foot? Regularly we end up exploring the three main areas where improvement is possible. Are these useful prompts for you? First, the ‘macro’. Are you doing the sort of work that you want? Are you playing to your strengths – and interests. 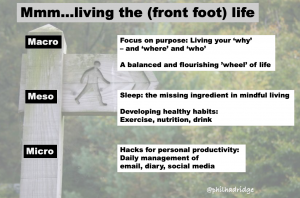 There is a load of stuff online to help you examine your life purpose: your ‘why’. Have a look for Simon Sinek if you don’t know where to start. How are you doing in achieving progress in the most important domains for you. Are you flourishing? Have you ever completed a ‘wheel of life’. How are you doing with maximising the size and smoothness of the circle? Do you need a career change? Or is some other big choice likely to help you? Second, the ‘micro’. Are you in charge of your work or is it determining you and your choices? There are load of hacks and apps to help you manage the demands for your time, and we have contributed to the burgeoning resources for personal productivity. Many of the ideas are quite simple but do take some discipline. For example, blocking chunks of time in your diary or running a daily ‘to do’ list or keeping an empty inbox by rapidly triaging emails and building a ‘for action’ folder. However, thirdly, is the ‘meso’, in the middle as the image below shows. I think this is particularly useful. The importance of developing a positive relationship with food and helpful exercise routines is well known. I promote some ideas for LADish drinking. Despite recent coverage an area with huge potential for improvement at this meso level for most of us is sleep. I meet people who are working to become mindful through mediation but who are short cutting their sleep every night due to domestic pressures or Netflix box sets. There is a burgeoning research into the importance of a good nights sleep and many tips for the things we can do to achieve it. For me going to bed early is key so any period of wakefulness and restlessness doesn’t really matter. We literally don’t have to have our backs (of our minds) against the clock. So, how is that? Macros, Meso, Micro. How can you edit your life so you are on the front foot? My colleague David Dowe and I were chatting recently. We got onto thinking about what it takes for an enterprise to be ‘governed’ well and to avoid governing systems going wrong (or at least not work well enough). There is a wide variety of ways organisations are established and led from owner run SMEs to the largest offices of State. ‘Governance’ is more likely to be explicitly discussed and not just assumed where there are formal structures such as Company Boards with non-executives, Charities with Trustees or campaign Steering Committees. For many years now, there has been a bit of a fashion for ‘Good Governance’. What does that mean – and how can it be assured? In answering this question, we have drawn on our experience of working in all sorts of environments over the last couple of years: from technology accelerators to school systems; professional associations to conservation charities; improvement projects to academic institutions. 1) The FRE framework for organisational success brings three fundamental roles for governing groups to mind. The first part of FRE is thinking of Focus: is the purpose of the organisation shared? Is the strategy clear – is it understood? Has the governing group set out its intentions (and limitations) for the wider staff to work toward and within? Second in the FRE framework is taking Responsibility: do governing boards avoid overstepping the mark and resist micro-managing the executive? The third part of FRE is the Example of senior leaders, including board members or trustees, in setting the cultural tone for an enterprise. This is a crucial, and often neglected, role of those involved in the governance of an organisation. The remainder of this checklist probes further into this territory of direction, scope and culture. 2) Governing groups are often expected to be many things: a sounding board giving advice; maybe providing a sort of litmus test before an idea is rolled out; and frequently a decision-making body too. It is a heady mix trying to be a critical friend to the executives and part of checks and balances in securing the best decisions and way forward. It is necessary to be clear on the scope of the governing roles – and to be sure that the governing group has the skills, and more important, the attention and awareness to do the job. Is the group clear what its primary purposes are? Does it spend time giving an overall direction with an overall strategy? Does it recruit and support a good CEO and then give them a clear sense of their autonomy and limitations, including how their performance will be reviewed? How far is the governing group involved in assuring itself that overall goals are being achieved, the finances are secure and the best possible organisational culture is established? 3) There are many cautionary tales of governing groups failing to take an interest, or get an accurate impression of, organisation culture (for example). Many boards govern through dashboards and metrics – but organisation leaders can game the measures and Boards find them hard to discern. 4) The mechanics of governing group meetings can be inefficient with an astonishing amount of managerial time spent preparing for board meetings, reporting, following up issues. There can be a degree of gaming and a seeming disconnect from the actual business sometimes. 5) Finding ways to keep in touch with both team delivery and organisation performance without overstepping the line into micro-management is a key balance and challenge for governing groups. Boards tend to deal in papers and presentations. It is very hard to really understand what staff are feeling and know whether the CEO is doing a great job or not. Their information often comes from others inside and outside of the organisation which introduces a time lag. Finding ways for the Board to get early warnings of unrest, confusion and non-attainment are important. Useful indicators can be the experience of interacting with staff who are only occasionally and unexpectedly encountered further into the organisation, spending time out and about and being alert to ‘weak signals’ (e.g. through complaints). 6) In doing its difficult work, is the governing group willing to have Critical conversations not just around issues of strategy and organisation process but also culture? For true consensus to emerge important issues need to be named and given sufficient air time on frequently packed agendas. In shaping the agenda and discussion it is important to recall previous discussions and reports – not just taking ‘matters arising’. Finding ways to remember previous promises made by the executive and have time to explore and question that productively and collaboratively. 7) Given these challenges, there are often choices about how to arrange (or, frequently, rearrange) governing systems. In our experience, there tends to be an over focus on the structural options at the expense of the behavioural. For example, a committee structure is more likely to be reviewed than the sort of decision making and scrutiny discussions to achieve a real improvement. There is a sort of ‘Inverse Attention Law’: where the changes that are most needed are less likely to be considered. Using a biological metaphor, sometimes the ‘Anatomy’ (that is, the structure of a board or its sub groups) needs changing, but more often it is the ‘Physiology’ of how the existing parts work together that is crucial. Getting the governing groups ways of working right is often more necessary than the overall wiring. 8) The role of the Chair is crucial. There are many high-powered Boards where strong personalities are quite deliberately given a platform to speak as separate voices. It is possible for the management team to take away different opinions on direction or performance. It is easy for chairs to either let all the voices speak (wishing to be seen as inclusive) or become too dictatorial. Pulling together a wider ranging debate into a clear corporate line can be difficult to achieve. This summing up is sometimes avoided to allow personal agendas to be pursued through the ‘smoke and mirrors’ after a meeting. Chairs are often chosen for their sector knowledge. However, the key role is to manage a good discussion and lead the development of a strong team (where you can disagree well en route to agreeing a collective line that all are publicly committed to, and where the group holds each other to using the best possible behaviours). 9) It is possible to invest too much power in the board, council or steering committee. Sometimes board members are very high powered and sit on lots of governing groups, possibly collecting too many appointments and not having sufficient time to give to their role. So it can be useful to find other ways to improve the advisory architecture so that checks and balances are in place. Setting up working groups and advisory groups can be used to show organisations are engaging more widely – but they can run into the many dozen, leading to a lack of consensus or good ideas get lost. 10) Given all this, what is a useful way forward? Well quite simply, take time to review how you are doing. Be prepared to question the “Inverse Attention Law”: the structure might need rejigging and processes rewiring. However, it is likely that securing the best behaviours will be a key task: achieving the physiology rather than the anatomy. Do you meet well? Do you have good conversations? It might seem a bit prosaic, but reviewing how your meetings go can be a good place to start, using something like this assessment – which can be presented in a variety of ways including as a wheel, and can be tracked over time. It is a simple first step: governing made easy. So “Just Governance”? It is not necessarily simple and straightforward. And yet it needs to be thought through and fair. It can then provide amazing value added oversight with a light touch. Helping the right things to happen, and helping avoid things going wrong. Around this time last year I was reflecting in a concert. I discovered FRE. Focus. Responsibility. Example. Three attributes for organisation success. That framework has guided my work this year. And carries on into 2017. I have had much positive feedback about it. I work helping systems improve. This support can be in my main sectors, be it fashion or conservation; education or health. Or it might be in the events I run, from team time outs to larger conferences; individual coaching to speaking. I am concerned with helping the smaller temporary systems, such as in a workshop. I am also focused on improving the larger, well-funded and enduring systems, such as a fashion supply chain or a programme on bio-diversity. After over 30 years helping in complex environments I have identified four pre-requisites for system success. You might even imagine these as four bases to get a ‘home’ run. Four capabilities that are needed to be widespread in a system for progress. Or you can consider them as a personal manifesto – highlighting the four personal disciplines leaders in all roles need for achievement. They are shared here to help us all make different and better choices. I summarise them as CHHH. That is curiosity, holistic (whole-sighted) attention, honesty and hope. Let’s unpack these four themes a little. Each helps progress. I have had positive comments on this from some of the many people I know who are working hard for improvement from deep within the systems they are committed to. Deepening curiosity helps us get beyond certainty and avoid hubris. There can be a pretence of motivation. There may be an interest in innovation in one’s own work, that is undermined by the failure to search out and copy what others are doing. In my decades of practice, I think low curiosity is the most striking and common observation – it limits progress, it leads to ‘reinvention of the wheel’ and the consequent waste. Addressing a low ‘pull’, where colleagues are not bothered and not interested in what others are doing is hard. Ways to fan the flames of interest maybe through protected study time and positive reinforcement, including awards for copying! Crucially, leaders need to model curiosity themselves – asking questions, showing they prize imitation as much as invention, avoiding routine pet answers, working in a spirit of humility and avoiding arrogance. Curiosity gets us on the journey. But it is only the first base. Once there is some curiosity, then finding ways to see the whole is important. However, looking beyond one’s own tribal allegiances can be a challenge. Building empathy with ‘the other’ is difficult. However, this is critical if the system is to operate for the end user or end purpose, and not the ‘core group’ who have much to benefit from things as they are. Connection is personal, and takes time to develop and deepen. Spending time exploring WITOS (what is the other side) is key. This is important for authentic attempts to make things better rather than cosy speaking in the groove, repeating nice sounding platitudes. This might involve a risk – especially when systems have a habit of spewing out whistle-blowers as ‘troublemakers’. Prophets and Radicals (tempered or otherwise) need to be sought and valued. Curiosity and Holism helps to nurture the empathy necessary for honesty. Finally, and maybe paradoxically given the tone of this piece so far, being positive is important. Burnout is a risk in system work. It is easy to end up with no hope for the system or even for oneself. Accepting critique, but looking beyond criticism and cynicism is the better route. Being personally buoyant in the face of all that needs to be done. Looking to encourage each other. I increasingly use these ideas (CHHH) as a frame and even as ‘ground rules’ in my workshops. I find them a useful diagnostic tool too. If systems are perfectly designed to deliver what they achieve, then the basic design rules need to be shifted. Might CHHH help? Inertia and entropy are design flaws to be addressed. If something seems impossible, start small. Where does CHHH point you? So, I offer CHHH a way to start or sustain the journey of improvement. When thinking about organisations I like the distinction between structure, process and behaviour. In one meeting last week I was challenged: “so, are you an organisational behaviourist?” Normally, I prefer to use Edgar Schein’s language and see myself as a ‘helper’ – and not even an OD specialist or Change Manager, which LinkedIn endorsements tend to say I am. So, I wasn’t sure I wanted the Organisation Behaviourist tag. But I guess I am the OB title. I see behaviour as key for it provides the physiology of organisational life – ways of working that can make any ‘anatomy’ work, or not. If I ask people to think of a leader they admire or a team that is performing well, and then write what it is about them down that impresses them, it is clear that the vast majority of the positive attributes are attitudes not technical skills, behaviour not knowledge. There are some notable approaches to orchestrating behaviour shifts through ‘nudges’. Also, there is lots of training offered to change behaviour – from ‘difficult conversations’ to ‘line management’ to ‘team working’. For me, the most significant improvements in organisation come from a disciplined focus on behavioural improvements around R and E in FRE – that is ‘responsibility’ and ‘example’. But I know from my work that the ongoing curiosity and empathy that is needed for this sort of sustained shift isn’t easy to generate and maintain. A recent HBR study shows that even the most thoughtful training approaches bring about minimum behavioural changes long term, in the absence of a shift in the example of senior leaders. This makes sense – at least it confirms the finding from my decade-old research about getting values into practice, see this. So these ‘soft’ shifts are hard. That is clear. On a recent trip to Australia I saw a new way of promoting a long lasting shift in the culture of organisations in action. I saw it at work in settings as diverse as a bank, a commonwealth department and in a food manufacturing plant. The ‘Blue Bus’ approach started out in steel manufacturing and mining. It is spreading. It is a sticky idea. There is a pull. It seems to be passing the Chili Test. It makes the distinction between ‘hardware’ and ‘software. Between the ‘spaces’ leaders regularly ‘play’ like strategy, tools and systems and the area that is really needed for individual, team and organisational performance: mind-set, values and behaviour. If you are in Asia or the Pacific (or even Australia!) and want to find out more, do let me know – I can make an e-intro. As there is deliberately almost nothing about it online. And, looking ahead, the guys (in a gender neutral sense) will be over in Europe in 2017. Bob, is a well-qualified clinician in his thirties. He has wanted to help development work overseas since a teenager. He has been waiting for THE job. In an organisation doing the most important work. Somewhere that would be a joy to work for. In one of world’s leading development charities. But Bob became deeply unhappy with what he considered the personal empire building amongst some of his colleagues plus some of the narrow rules and systems that seemed designed to control the many motivated middle level staff. So he left. Disillusioned. Almost burnout. Definitely dispirited and pretty cynical. There are at least two interpretations to this sad tale. First, Bob doesn’t like fitting in – as a ‘true believer’ he sees himself as highly motivated and wanting the space to determine his own priorities. Others in the organisation, especially those more senior or long toothed, know the value of management systems in these difficult roles as a way of holding to account young, self-centred idealists. Second maybe Bob was just overwhelmed by the self-interest of others, just as he said. Frued is reported to have said in the cliché: “sometimes a cigar is just a cigar”. Knowing him (and the organisation), I think the it is probably latter. Others might say former.